Something Good is Happening in Villa Rica! If you’ve been following STPAL’s development for a while, then you’d know that in October of 2015 we donated 160 acres of greenspace known as Connors Road Park to the city of Villa Rica. Well, now the Villa Rica, with the help of PATH Foundation and Kaizen Collaborative, is planning to build out a 22.6-mile trail system all throughout the city known as the Gold Nugget Trail, and, of course, a major section of this trail is going to be built all throughout Connors Road Park! While the development of these trails may be a couple years away, this is still great news! Ever since we gave the land to Villa Rica, STPAL was hoping that the city would build it out into a proper passive recreation park, and what is a park without walking and biking trails? The story of Connors Road Park is far from over, so expect us to keep you all up to date with any important happenings on the project. If you are interested in how the Gold Nugget Trail system will look or how it came to then feel free to check out the presentation at the link below. July 2, 2015. Representatives from STPAL, the City of Villa Rica, and community members touring Connor Road Park. This group worked to complete the transfer of the park on October 23, 2015. Talking Rock is Going Strong! The 2.75-mile green trail loop (now known as Jon’s Trail) was completed. It was designed and built to be smooth with no roots and rocks. It’s great for mountain bikers of all ages and abilities with no steep hills anywhere to be found. Newbies and veteran bikers often come up to us and say that it’s one of the most fun trails in North Georgia! The blue trail loop of 1.25 miles (now known as Nitro Nix South), as well as the Preserve parking lot, has been completed. This second loop is fundamentally the same as the Jon’s Trail, but it is a much faster ride that is meant for cyclists with a little more mountain biking experience. North of the parking lot is the other completed blue trail (now known as Nitro Nix North). It is a 1-mile down-and-back that stretches from our parking lot to the Northern-most point of the property. This trail is slightly more tricky to ride than its neighbor, Nitro Nix South. The fourth and fifth trails, stretching 0.3 and 0.7 miles respectively, were also completed. They are both designed for foot traffic and those looking to run or walk through nature without needing to constantly be on the lookout for oncoming cyclists. The 0.3-mile orange trail (now known as Pollinator Walk) takes you from Jon’s Trail up to the pollinator garden and beehives at an easy incline designed with small children and elderly people in mind. The 0.7-mile red trail (now known as Charlie’s Trail) is a loop that is slightly more difficult than Pollinator Walk but makes up for it by taking you through some of the most beautiful parts of the Preserve including a pleasant walk alongside a bubbling creek. This trail is unique in that before 5:00 PM it is a foot traffic only trail, but after that, it becomes a shared trail for both bikers and walkers/runners. For the younger riders who are looking for something a little bit different, we have also begun construction on a bike park at Talking Rock. It currently has a small pump track and a downhill run we hope to unveil in the near future with 2-4 more downhill runs still in the planning stages. We have also begun planning out the final 5-6 miles of trails. We would love to create an enormous trail section with steep hills, jumps, rock gardens, and other features for serious riders that will stretch from the northern border of the Preserve to the southern border. It will be the hardest trail by far (a double black diamond), and we are currently in the process of raising funds for its construction. We celebrated our Trail-Dedication ceremony and Bike Demo Day on May 5th, 2018. With the help of Cartacay Bike Shop, Jamis Bikes, Dunkin’ Donuts, and Anytime Fitness, we were able to come together and celebrate all of our hard work and test the capacity of the Preserve at the same time! So many of the local community and volunteers came out to mark the day as a truly special celebration for people all over North Georgia. We hope to put on more events and celebrations as the Preserve continues to expand and solidify itself as an important part of the community. 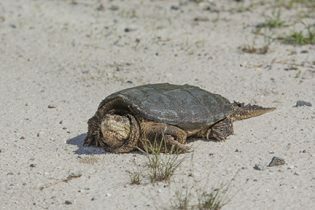 The main infrastructure at the Preserve has been established as well. Much of the signage has been installed, a porta-john near the parking lot has been installed, bike borders are now at road-trail intersections, message boards with maps and other park information have been put up, and now, we have more than 30 wooden benches and 10 picnic tables that community members can sponsor. We even built a closed-off apiary for beekeepers in the area to house their beehives and teach others all about bees and other North Georgia pollinators. Speaking of the local Pickens community, we have saved one of our proudest accomplishments for last. We have established a successful community group for the park called the Friends of Talking Rock! We have about 20 core members in the group as well as many others who are involved in one way or another. The Friends of Talking Rock have even begun to divide into a few smaller subgroups. Groups interested in hiking, running, conservation, and beekeeping have all sprung up because of the Friends. And, we believe that none of the successes of the group could have been accomplished without the excellent help of Susan Crain, who acted as a paid consultant and wonderful volunteer for the project. Thanks to everyone who has helped make the first six months of this Talking Rock Nature Preserve experiment the grand slam that it is, and we hope to be here in another six months with even more great news to share. While we know that this isn’t the greatest format for our blog, as we usually post about building trails and conserving land, the Southeastern Trust would still like to take the time to share some of its more higher level operations for the sake of easy access and transparency. Southeastern Trust for Parks and Land will have diverse community-based partnerships for conservation, education, and public recreation. Southeastern Trust for Parks and Land was formed for the purposes of conserving land, providing public benefit, and to be a model public charity. Therefore, STPAL shall function with the highest ideals. It shall always seek the greatest benefit towards its mission in all cases. It shall function with transparency. It shall make decisions that are always biased towards land conservation and public benefit. STPAL is building a park in Talking Rock, Georgia! Talking Rock Nature Preserve provides a vast scenic view that “speaks” to all that take timeout, stop, observe and listen. Your heart, mind and soul will become captivated as you sit among the rocks and scan the pristine landscape allowing your senses to absorb all that abounds. Talking Rock includes 220 acres of natural beauty that provide a glimpse into a multitude of ecosystems, opportunities for environmental education and a diverse mix of passive recreational experiences open to the public. Talking Rock Nature Preserve was donated to Southeastern Trust for Parks and Land (STPAL) in 2012. Desiring to preserve the natural land while providing experiences for the general public, STPAL embarked on a park plan visioning and designing phase. A Master Vision Plan has been created and amenities will be implemented in phases and as community support allows. The Vision calls for some opportunities not currently found in Pickens County. Click for the Site Plan! The 12 mile trail system has been flagged and is being constructed. Funds have been raised for the first 5 miles of the trail system. The first loop of 2.75 miles is completed and being used by bikers and walkers. It was designed and built to be a smooth with no roots and rocks. It is good for mountain bikers of all ages and abilities. There are no steep hills to climb or go down. It is fun. The second loop of 1.75 miles and the parking area will be complete by mid December. This second loop is fundamentally the same as the other loop but it will be a much faster ride and meant for riders with some mountain biking experience. The final 5-7 miles will feature a trails and sections with steep hills, jumps, rock gardens, and other features that will appeal to serious riders. Yes, we think we are building a trail system for everyone to use and enjoy. And, of course hikers / walkers are welcome on the entire system. For safety and enjoyment walk the opposite of the riders (directions are posted at trail heads) and step off the trail for a moment as bikers pass. Bikers slow down when passing walkers. We expect to formally open the park and have a ribbon cutting sometime in January. Currently two Boy Scout Eagle Projects are underway. There are many Eagle Project opportunities so if you are considering your project and community impact check out our Wish List. A Talking Rock Friends Group is now being formed. As a nonprofit, volunteers and community support are crucial to progression of the park. Friends may help during volunteer workdays, raise funding to support park elements but most importantly, provide input into desired park elements. Your engagement will help Talking Rock to become a best kept secret in the greater Pickens Community. Donate funds to help provide an element for the park. Naming opportunities are available and information is available by contact STPAL. Donate to Support the Project Here! Don’t forget to follow us on FaceBook: Talking Rock park Facebook page! The Talking Rock Property (the “Property”) is located adjacent to Old Whitestone Road East and is bisected by Carnes Mill Road. From Atlanta, travel north on Highway 575 and continue on 515 (Zell Miller Parkway). Turn left onto Carnes Mill Road and travel 0.73 miles to the southern property boundary. The Property borders both sides of Carnes Mill Road for an additional 0.5 miles. We are done designing and flagging 12 miles of new multi-use trails at Talking Rock Nature Preserve! Big News! We have now completed flagging for 11.86 miles of multi-use natural surface trails at Talking Rock Nature Preserve. Our cost to do this was about $1,000 per mile. We are working with Pickens County to get their approval to build the first 5-6 miles of trails! We have about $75,000 allocated for that and can’t wait to get it going. Something good is happening in Pickens County Georgia! Follow the progress here and on the Talking Rock facebook page and give it a LIKE while you are there. Thanks to many generous supporters we were able to acquire 12 new properties and 3 conservation easements totaling 5,000 acres protected at sites across our service area. We donated The Boot Nature Preserve to Douglas County, Georgia. 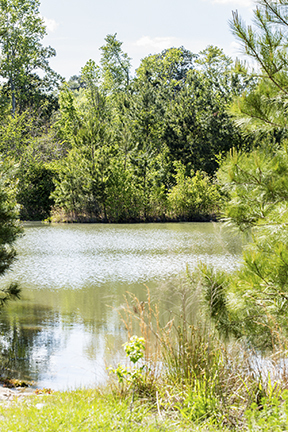 The 80-acre tract is beautiful natural land along a little lake. Douglas County has already begun transforming it into a passive recreation park for the public. We began our first major park build at Talking Rock Nature Preserve. Phase 1 will about 6 miles of natural surface multi-use trails. We plan to add 6 additional miles of trails, a disc course, and park amenities. 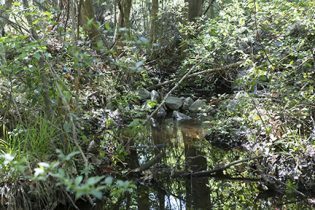 At Bald Mountain Creek Nature Preserve in Northwest North Carolina, we funded the removal of a culvert stream crossing and replaced it with a bridge. Local “friends of the nature preserve” completely handled the project for half of the expected cost. It’s an important improvement for the stream and its native brook trout.